I’ve written a series of blog posts about the episode of The O Show that I produced for ‘P o P’ (Potentials of Performance), the closing event of the 3-year, AHRC-funded research project Performance Matters. My writing elaborates on the thinking behind the episode, which explores the relationship between the therapeutic process and performance. 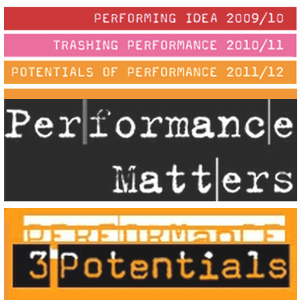 Following Performing Idea (2009/2010) and Trashing Performance (2010/2011), Potentials of Performance (2011/12) focuses on performance’s emergent and unrealised potential: what does performance hold in store in its present-day testing of the limits of the social, the cultural, the vital and the critical? What lies latent within and around performance? What is waiting to be realised, developed, and made legible? P o P culminates Potentials of Performance – the third and final year of Performance Matters, a collaboration between Live Art Development Agency, Goldsmiths University of London, and University of Roehampton. Funded by AHRC.